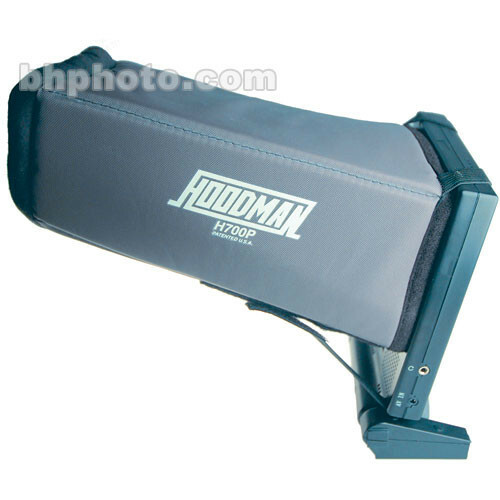 The Hoodman H900 is a sun shield hood designed specifically for the high resolution Panasonic BT-LH900 and BT-LH900A field monitors, eliminating glare. The length is useful by allowing the operator to view at the proper distance, reducing eyestrain. This Hoodman hood will also fit other 8.4" LCDs such as those from Marshall Electronics. Box Dimensions (LxWxH) 13.5 x 9.0 x 1.6"
H900 8.4" Long Hood is rated 4.7 out of 5 by 3. Rated 5 out of 5 by Anonymous from Hoodman Quality The usual Hoodman quality. Well-made.